Using ESA’s Gaia satellite, a team of astronomers has discovered a “heavy metal” supernova that challenges current ideas of how and where such super-charged supernovas occur. Many rock stars don’t like to play by the rules, and a cosmic one is no exception. A team of astronomers has discovered that an extraordinarily bright supernova occurred in a surprising location. Supernovas are some of the most energetic events in the Universe. When a massive star runs out of fuel, it can collapse onto itself and create a spectacular explosion that briefly outshines an entire galaxy, dispersing vital elements into space. In the past decade, astronomers have discovered about fifty supernovas, out of the thousands known, that are particularly powerful. These explosions are up to 100 times brighter than other supernovas caused by the collapse of a massive star. Following the recent discovery of one of these “superluminous supernovas”, a team of astronomers led by Matt Nicholl from the Harvard-Smithsonian Center for Astrophysics (CfA) in Cambridge, Mass., has uncovered vital clues about where some of these extraordinary objects come from. Cambridge University’s Gaia Science Alerts team discovered this supernova, dubbed SN 2017egm, on May 23, 2017 with the European Space Agency’s Gaia satellite. A team led by Subo Dong of the Kavli Institute for Astronomy and Astrophysics at Peking University used the Nordic Optical Telescope to identify it as a superluminous supernova. 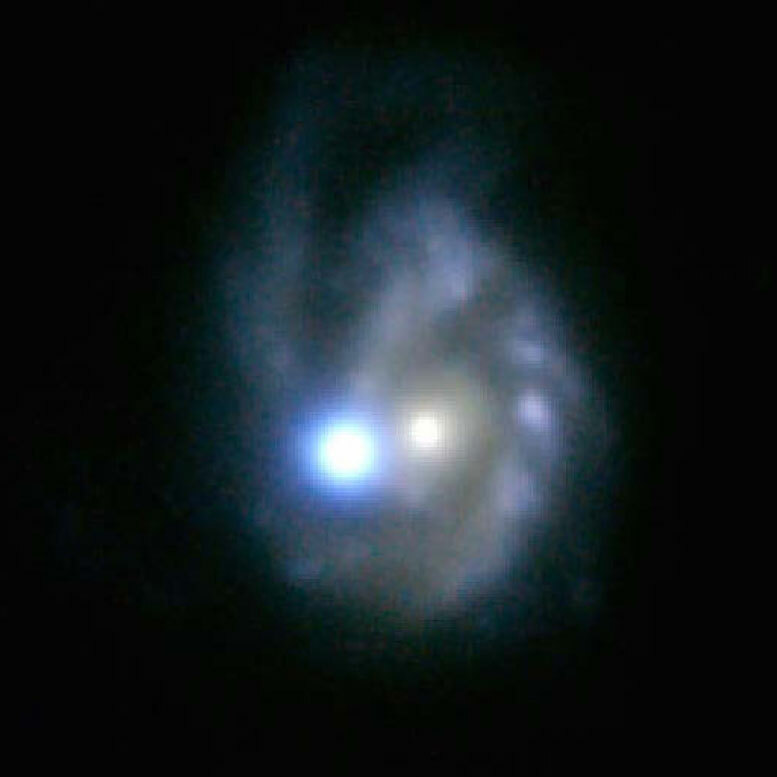 SN 2017egm is located in a spiral galaxy about 420 million light years from Earth, making it about three times closer than any other superluminous supernova previously seen. Dong realized that the galaxy was very surprising, as virtually all known superluminous supernovas have been found in dwarf galaxies that are much smaller than spiral galaxies like the Milky Way. Building on this discovery, the CfA team found that SN 2017egm’s host galaxy has a high concentration of elements heavier than hydrogen and helium, which astronomers call “metals”. This is the first clear evidence for a metal-rich birthplace for a superluminous supernova. The dwarf galaxies that usually host superluminous supernovas are known to have a low metal content, which was thought to be an essential ingredient for making these explosions. This optical image from the Panoramic Survey Telescope and Rapid Response System (Pan-STARRS) shows the metal-rich spiral galaxy NGC 3191, the host of the closest superluminous supernova to the Earth discovered to date, SN 2017egm. The supernova is visualized by adding a simulated source that matches the measured position, blue color and intensity of this intense cataclysmic event. Pan-STARRS/CfA/M. Nicholl et al. The CfA researchers also found more clues about the nature of SN 2017egm. 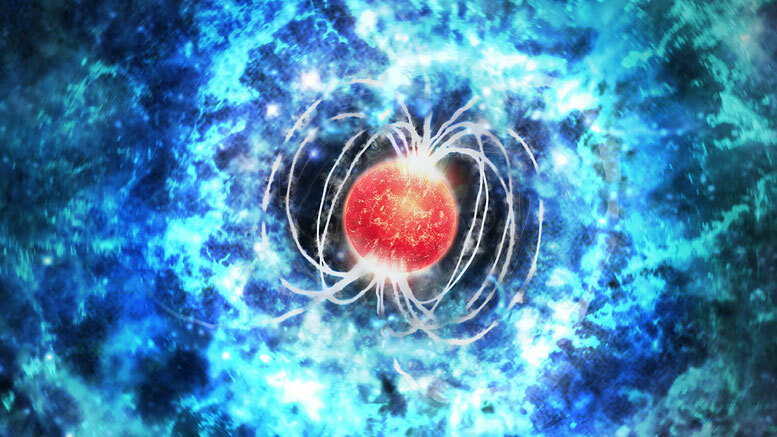 In particular, their new study supports the idea that a rapidly spinning, highly magnetized neutron star, called a magnetar, is likely the engine that drives the incredible amount of light generated by these supernovas. While the brightness of SN 2017egm and the properties of the magnetar that powers it overlap with those of other superluminous supernovas, the amount of mass ejected by SN 2017egm may be lower than the average event. This difference may indicate that the massive star that led to SN 2017egm lost more mass than most superluminous supernova progenitors before exploding. The spin rate of the magnetar may also be slower than average. These results show that the amount of metals has at most only a small effect on the properties of a superluminous supernova and the engine driving it. However, the metal-rich variety occurs at only about 10% of the rate of the metal-poor ones. Similar results have been found for bursts of gamma rays associated with the explosion of massive stars. This suggests a close association between these two types of objects. From July 4th, 2017 until September 16th, 2017 the supernova is not observable because it is too close to the Sun. After that, detailed studies should be possible for at least a few more years. The CfA team observed SN 2017egm on June 18th with the 60-inch telescope at the Smithsonian Astrophysical Observatory’s Fred Lawrence Whipple Observatory in Arizona. A paper by Matt Nicholl describing these results was recently accepted for publication in The Astrophysical Journal Letters, and is available online. In addition to Berger and Margutti, the co-authors of the paper are Peter Blanchard, James Guillochon, and Joel Leja, all of the CfA, and Ryan Chornock of Ohio University in Athens, Ohio. Be the first to comment on "“Heavy Metal” Supernova Discovery Challenges Current Ideas of How Supernovas Occur"